What type of art is your specialty & why? Realistic/representational painting and drawing are my specialties. As for subject matter I can’t really say I have a specialty. I’ve done a little of just about everything as a function of my career as a commercial illustrator. Most of my work in the past has included or revolved around people/characters in the imagery. For the most part my pictures tell a story or contain symbolism that makes a statement or conveys an idea or concept. I think those are the aspects that really bring a picture to life and give it substance and meaning beyond being just a pretty decoration. How long have you considered yourself an artist? How long have you been creating artwork? I suppose I’ve considered myself an artist most of my life. Well, actually, I can say I liked to make art (pictures or graphics) most of my life. When I was very young I didn’t really know you could do art for real, for a living. I had thought everyone could draw, that it was just a hobby one could have and some people did it better than others, and sometimes, if it was really good, it would end up in a museum. I wanted to do it because it felt good and was fun to make things. Did you study professionally? Where? No, I’ve never been a professional student. I did go to art school though! I was fortunate enough to have a great art department in both middle school, and high school. And even more fortunate to get private drawing lessons as a young teenager from a great artist who gave a presentation in my high school art class. That was Carroll N. Jones III. I was awed by his drawings the moment I saw them that day. I wanted to do what he did, and I’d do anything to learn how. So, every Wednesday after school I took a forty minute train ride to Hoboken, NJ where he lived and had a few hour lesson with him. That was really a great time for me. After high school I went to duCret School of Art in Plainfield, NJ. There, I met my painting/illustration mentor Peter Caras, who taught me how to paint in oil, and introduced me to the field of illustration which, again, knocked my socks off. I thought “This is the thing for me – I want to do what he does.” After two years there I was offered advanced placement at the School of Visual Arts in NYC, so I went there because they had a great reputation and thought that would help my advancement. After a year there I ran into administrative difficulties and also missed the more “hands on” tutorial approach I had at duCret, so I went back and graduated from there. I like pencil and oil mostly. Probably because of my education history, but I like watercolor as well. I’ve worked in almost all mediums, and the others never really caught on with me. I guess they weren’t really able to facilitate my vision of what I wanted to do. What is your preferred subject and why? I don’t really have a preferred subject matter. My preference is ideas and concepts, and whatever subject matter it takes to convey that is what I paint. And, anything new is always interesting and challenging. Challenge is good. I’m easily bored, which I’m trying to get over. I don’t know that I have one. Others have told me that I do, but I don’t see it. I suppose it’s like looking in the mirror, it’s my face I see. Not this, not that, not good, not bad, just a thing I have lived with all my life. How do you feel your work has developed throughout the years. Aside from being more technically proficient, I really couldn’t say. (See above) I suppose it’s like finding a new wrinkle in your skin – it’s there, but doesn’t make much of a difference, I don’t know, maybe it does and I just don’t see it. Or maybe I’m not paying attention! What is the worst thing about being an artist? The things that inspire me in general are very personal. Money and self-expression, and other artists making a living in creative fields motivate me. Not necessarily in that order all of the time. Pay attention…to everything. Don’t give up. What inspired you at the winery? Lots of things inspired me, but I think it was mostly the technical, mechanical aspects of the wine making process. Of course the grounds; the landscape was beautiful, but the mechanical/physical elements involved in the process of wine making were new to me, unsuspected and curious. How did you get your inspiration there? Just by looking around and absorbing things I suppose. I don’t think inspiration is something one finds…you can look for a motive, a basis, but I think inspiration just comes…it finds you. Do you plan your work carefully with sketches, photos and grids, or do you work with gesture and intuition? Yes. All of the above, but no grids. Tell us more about your artwork created at the winery. What is most satisfying about making art based inspired by the winery? It’s new and exciting and challenging. A breath of fresh air. 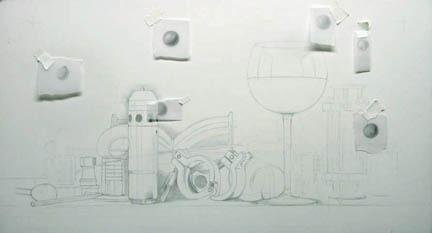 What is most frustrating about making art inspired by the winery? It’s new and exciting and challenging. A lot of work. A lot of new decisions to make. This entry was posted in Art and Wine, Artist & Winery Pairing, Artist Info, Artist Updates and tagged art and wine, Artist & Winery Pairing, artist and wine pairing, hudson valley art, hudson valley wine, new york art and wine, Vince Natale, Whitecliff Vineyard. Bookmark the permalink.